My friend Nikki had their birthday recently. I had found out recently that Nikki was really into Promethea, a comic book by Alan Moore that really influenced me after college. It’s pretty much Alan Moore’s entire philosophy and inspirations compiled into 5 books, it’s weird, it’s fascinating, and incredibly new-agey but it was a blast to read. 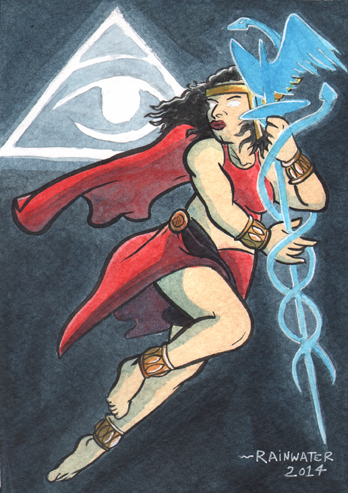 It was a lot of fun to share my enthusiasm for that book with Nikki buy painting them as Promethea, and a good challenge to draw somebody’s portrait in this way. This painting was finished in ink and watercolor.